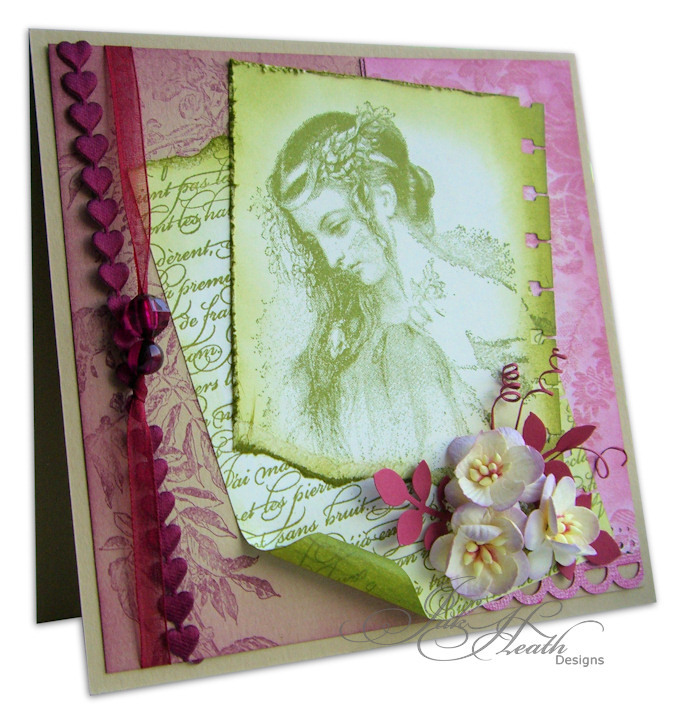 My first love when I started card making was/is vintage, I love the soft muted tones, the romance and the dreaminess of a by gone era. This stamp is called Ophelia, for those that don't know Ophelia is a Character in Hamlet wrote by William Shakespeare and she fell in love with Hamlet and was so rejected by him that she went insane. 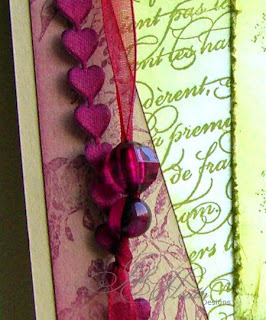 I used olive green and wine coloured ink, pretty cherry blossoms a text stamp by Stampin Up and a bit of love to finish the card. A close up of Ophelia, distressed edges, notebook spiral punch used too, you can see the vines in the bottom right corner, just very thin pieces of card wrapped around my tweezers into a spiral shape. I found the most pretty ribbon in my local haberdashery, hearts, shear ribbon and beads, what more could I ask for? What a serene looking card, beautiful. Absolutely gorgeous card Jak and I just love what you have done on it. I think the flowers on the corner just finish this card to perfection. 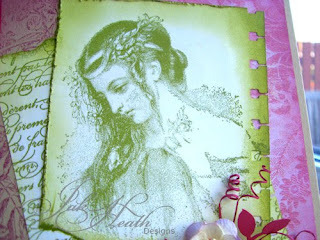 Beatiful vintage card and i love that colour combination its a wow !! Beautiful image Jak. I love the way you have worked the two colours together and the trimmings are fabulous. This is beautiful Jak. Stunning colours. Jak, this is sooo pretty -- your colors are gorgeous and that trim is so perfect!!! This is a magnificent card Jak, Never yet tried a vintage one.
. You have definitely changed my mind on the vintage theme now. I just love the way you put everything together. The colours are absolutely perfect and everything compliments the whole thing. This card is really gorgeous and I love all the little details on it. Really inspiring and the colors work wonderfully together. Beautiful card,lovely colours and papers and gorgeous image. The coordinating flowers look lovely. Beautiful soft vintage card Jak- love the colours. Jak! This card is so beautiful! A stamper who saw it and ordered Ophelia from me gave me the link and I'm beyond delighted to see your beautiful work! beautiful card! so delicate colours and flowers! gorgeous! 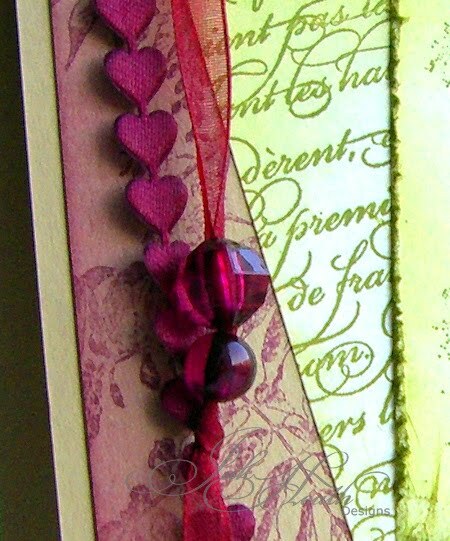 The two colours together on this card go really well together - and the image really has a romantic feel to it.